*Note: To access our Maine lake cabin rentals Facebook page you must be logged into your Facebook account or you can find us on Facebook by searching for Long Lake Camps Group. Your Maine Lake Cabin Rentals Await! If you are interested in great smallmouth bass fishing, a terrific family vacation spot or peace and tranquility, keep scrolling. Long Lake Camps are on a private 40 acre peninsula (Rolfe Point) surrounded entirely by woods and water. Long Lake is part of a huge watershed which includes Long Lake, Big Lake, Lewey Lake, West Grand Lake, Grand Lake Stream, the Grand Falls Flowage and the St. Croix River. We have 12 lake cabin rentals which are made from native Maine cedar logs and are located along the shoreline. All the cabins are clean, cozy and comfortably furnished with the amenities of wood stoves, electricity, and full baths with showers. Many of the cabins have full kitchens to accommodate doing your own housekeeping or if you want the American Plan you can enjoy delicious meals, and lodging. We have a beautiful main lodge with a commercial kitchen, a formal dining room, sitting room and library stocked with a fine selection of outdoor and Maine oriented books. Another popular space is our new recreation hall which is equipped with a pool table, a ping pong table, children's toys, board games and a sitting area. In front of the hall is our large dock and a nice swimming area with a raft anchored further out for the older kids. Behind the hall, we have a fire pit for campfires and beside it a small building for life jackets, oars and fishing equipment. There are plenty of activities here at Long Lake Camps. For the younger kids we have a play area. We also have a small store where we sell lures, books, T-shirts, caps, beanie babies, candy and ice. Boats/motors, canoes, a kayak, and paddle boat are available for daily rentals or you are welcome to bring your own boat. NOTE that we sell non-resident licenses as well. For the adventurous, we have professional guides ready and eager to amaze you on fishing and outdoor discovery trips in the area. Long Lake is located in Washington County’s Quoddy Loop Region and is a two-hour drive northeast of Bangor via Route 9 or Route 6. We are 2 miles from Princeton, a small town with a grocery/hardware store, gas stations, post office, bank, boat shop, emergency clinic, and small airport. 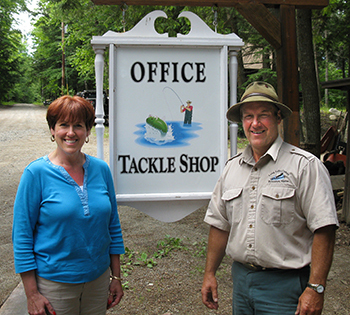 We are ideally located an hour from the Maine coast and about 45 minutes from the Canadian Border. Not only can you be on a beautiful remote lake but also you can take day trips to interesting landscapes and historical sites. Long Lake is part of a huge watershed which includes Long Lake, Big Lake, Lewey Lake, West Grand Lake, Grand Lake Stream, the Grand Falls Flowage and the St. Croix River. One mile up Long Lake is the Passamaquoddy tribal lands and two miles down river is the tiny town of Princeton. 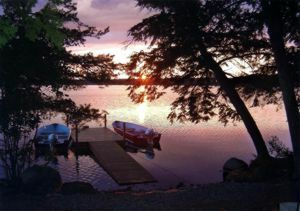 Make our Maine lake cabin rentals your home away from home!